• single story – FOR RENT CAD1,600 1Y . 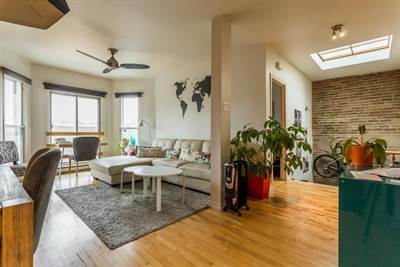 In the heart of Plateau Mont-Royal, within walking distance of the Metro, warm and bright 2 bedroom apartment, located on the top floor with a magnificent view of the Mountain. Washer, dryer, refrigerator, hood, hot water tank, kitchen island, storage in the master bedroom. Lovely apartment on the top floor, bright with its skylight and large windows overlooking the mountains. Well arranged, you find a room on your left as soon as you arrive at the top of the stairs and another on your right. The bathroom is being renovated. The kitchen redone in 2010, overlooks a small balcony. The open concept living / dining room enjoys maximum sunshine all afternoon and have a mountain view. the brick wall in the living room, kitchen and in the stairwell gives the apartment a very warm atmosphere. **TENANTS SHOULD PROVIDE: Letter from the employer, bank or credit references, proof of home insurance before taking possession of the premises. **Security deposit equivalent to one month’s rent is required of the TENANT at the signing of the lease.